Producers: Chiu Fu-Sheng, Hou Xiaoxian, Zhang Wenze; screenplay: Ni Zhen, based on a short story by Su Tong; photography: Zhao Fei; editor: Du Yuan; assistant directors: Zhang Haniie, Gao Jingwen; art directors: Cao Jiuping, Dong Huamiao; music: Zhao Jiping, Naoki Tachikawa; sound: Li Lanhua; make-up: Sun Wei; costumes: Huang Lihua. Cast: Gong Li ( Songlian ); Ma Jingwu ( Chen Zuoqian ); He Caifei ( Meishan ); Cao Cuifeng ( Zhuoyun ); Jin Shuyuan ( Yuru ); Kong Lin ( Yan'er ); Ding Weimin ( Mother Song ); Cui Zhigang ( Doctor Gao ); Zhou Qi ( head servant ). Chute, David, "Golden Hours" in Film Comment (Denville, New Jersey), March/April 1991. Reynaud, Berenice, "China—On the Set with Zhang Yimou" in Sight and Sound (London), July 1991. Variety (New York), 7 October 1991. Reynaud, Berenice, "Ghosts of the Future," in Sight and Sound , (London), November 1991. Niogret, H., "Rouge, noir et blanc" in Positif (Paris), January 1992. Bassan, R., Revue du Cinéma (Paris), January 1992. Glaessner, V., Sight and Sound (London), February 1992. Garcia, M., Films in Review (London), May-June 1992. Fortin, P., Séquences (Montreal), September 1992. Younis, R., Cinema Papers (Victoria), October 1992. Sutton, D.S., "Ritual, History and the Films of Zhang Yimou," in East-West (Honolulu), July 1994. Klawans, S., "Zhang Yimou," in Film Comment (New York), vol. 31, September-October 1995. Young-Sau Fong, Suzie, "The Voice of Feminine Madness in Zhang Yimou's Dahong Denglong Gaogao Gua, " in Asian Cinema (Drexel Hill), Spring 1995. Lee, Joann, "Zhang Yimou's Raise the Red Lantern : Contextual Analysis of Film through a Confucian/Feminist Matrix," in Asian Cinema (Drexel Hill), Spring 1996. Kong, Haili, "Symbolism through Zhang Yimou's Subversive Lens in His Early Films," in Asian Cinema (Drexel Hill), Winter 1996–1997. 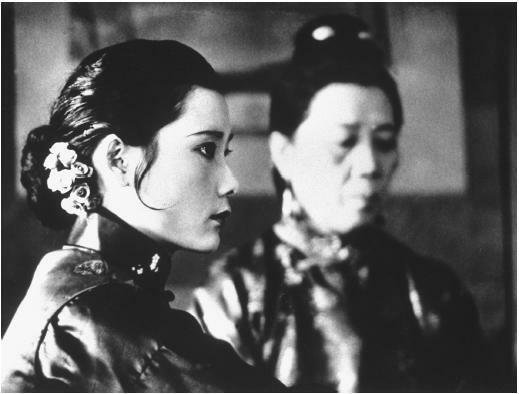 Wei, Y., "Music and Femininity in Zhang Yimou's Family Melodrama," in CineAction (Toronto), no. 42, 1997. Raise the Red Lantern was one of the rare Chinese films successfully marketed in America and its success has been ascribed to its exotic formula of a man with five wives and the radiant beauty of the star Gong Li. The film has certainly capped the international reputation of its director Zhang Yimou and made him the most successful director among the "Fifth Generation" filmmakers (including Chen Kaige, Tian Zhuangzhuang, Wu Ziniu) who first made their mark in Chinese cinema in the mid-1980s. Superficially at least, Raise the Red Lantern has all the hallmarks of a sizzling soap-opera melodrama featuring the beautiful Gong Li as the fourth wife of Master Chen, a wealthy, traditionalist husband of the Chinese gentry class. Master Chen's mansion is divided into four quarters or courtyards—each occupied by one of his wives, who are all enjoined to live harmoniously under one roof. It is a manor dominated by the observance of arcane rituals, family rules and regulations—a central ritual being the hanging of red lanterns in the quarters of the master's choice of sleeping partner for the night. The plot ingredients of a melodrama come into play as three of the wives—Zhuoyun (the second wife), Meishan (the third wife, an opera singer), and Songlian (the fourth and most recent wife, played by Gong Li),—become rivals for the master's affections (the first wife being too old to be a serious rival). Zhuoyun is deceptively friendly, showing her true colours in the course of the film, as the most treacherous of the master's wives. Meishan hides her tragic vulnerability beneath a bitchy, cunning veneer, while Songlian is equally vulnerable but much less equipped to handle the politics of rivalry and jealousy. The object is not only to win the master's affections but to exert authority over the wider household of other concubines and servants. As a servant says, "authority is where the lantern is hung." To complicate matters, Songlian's servant, Yan, has ambitions of her own to become one of the master's mistresses. Yan taunts Songlian by being mildly rebellious and insolent (going against regulations, she hangs up torn and patched red lanterns in her own room), and informs on her mistress' activities in Zhuoyun. was the place where two women had died tragically by hanging themselves. It is this room that rounds off the film's climax (as third mistress Meishan, discovered for her infidelity, is dragged and locked up there) and precipitates Songlian's tragedy. The chronology of the narrative takes place over the seasons of the year; the events are confined to the settings of a single household, done in the elaborate style of a Chinese manor-house complete with multiple courtyards, rooms, antechambers, and servants' quarters, separated by walls and lanes. This architectural marvel is as much a part of the story as are the characters, who often seem minuscule against the grand setting of the building (alone in a courtyard, or standing behind a towering facade). Indeed, the film is distinguished by Zhang Yimou's penchant for long shots which take full advantage of his marvellous location and interior sets. There are almost no close-ups in the film—the camera getting no closer to the characters than the medium shot. When closer shots are employed, Zhang almost always favours his female characters—the one overtly conscious sign of the director's storytelling sensibility motivating his series of films, beginning with Red Sorghum , that are all centred around women (all played by Gong Li). The master of the household is, in fact, always in long shots, with the camera deliberately avoiding showing this character in full face. The device accentuates the distance of the one significant male character, both from the perspectives of the audience as well as those of the key female characters. The long shot is a trait shared by Zhang's Fifth Generation colleagues (Chen Kaige, in particular, for whom Zhang served as director of photography on his first two films) and is a manifestation of the objective eye. In Fifth Generation work, the objective eye functions primarily as a visual endowment of film narratives. It points up the stunning visual qualities of the director's compositions, and "fills in" the narrative space that is not covered by dialogue. On the other hand, the long shot tends to reinforce the structural look of a film and gains a semiotic, symbolic function as well. In Raise the Red Lantern , the structural compositions and their symbolic derivatives shore up the sense of distance in time and space and the psychology of the female characters as they engage in what modern feminists would consider absurd rivalry and power-play. The strength of the Fifth Generation directors lies in the ability to exploit historical objectivity and a highly personal approach to narrative filmmaking, thus breaking with the tradition of didacticism and literary approaches in Chinese cinema. That Zhang's success in the West is attributed to exoticism is a price he must pay as his films assume more formalized and realist, down-to-earth properties (as may be seen in The Story of Qiu Ju and his latest, To Live ).